What do you think? It's kind of funky looking, right? Like the background wants to be a gradient, but it doesn't quite reach the mark and ends up looking hella interesting. This design is inspired by the super awesome Black Queen Nails Design on Instagram, her nails are so flawless so definitely go check her out if you don't know who she is. You're probably thinking to yourself, uh Rose is that not just a gradient? I kind of want to describe it as a returning gradient, where it rotates from one color to another back and forth. You can definitely use polish instead of acrylic paint and in some regard I think it would of been easier. My colors tended to blend a little too much and honestly this concept would definitely look better if you use contrasting shades. And there is a video tutorial, but no voice over this time guys. I was going to do it quickly, but honestly this week has been too hectic health wise. Next week though you'll get so much of my voice, you're going to mute my videos half way through them, haha. But seriously, I have a lot of things planned including some more unboxing videos, the return of Puppy Prints, and live swatching. Hint hint, be sure to subscribe if you haven't so you don't miss out! I hope you like this my mani turned out, be sure to let me know what you think. And as always, go and checkout the other talented nail artists participating in this weeks challenge and bask in all the things purple... I mean 'violet' haha. I love these! I like the idea of a "returning gradient," I think that's a great name! I like the uniqueness of this mani! Thanks for sharing the video! I'll give it surely a go because I'm drooling over your pics! 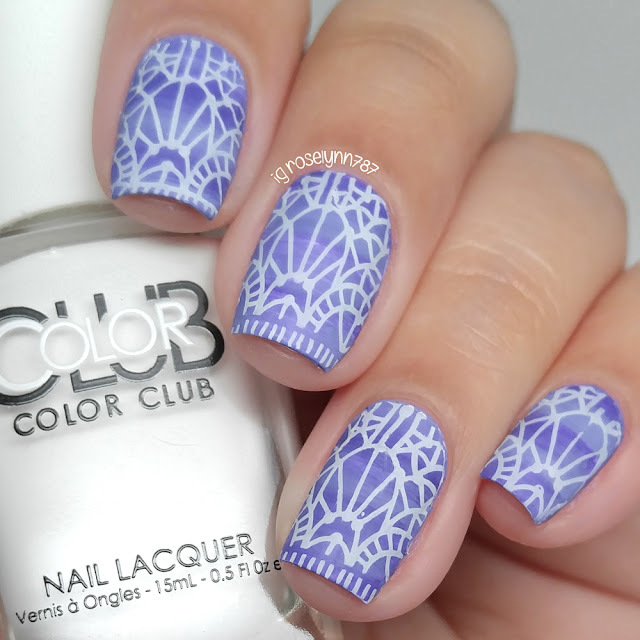 This mani is beyond gorgeous!